Governor Andrew M. Cuomo signed an executive order launching a new LGBT Memorial Commission to provide recommendations on the establishment of a new monument in New York City honoring the LGBT community, those lost in Orlando and all victims of hate, intolerance and violence. As part of the announcement, the Governor also designated the legendary Stonewall Inn, the birthplace of the modern LGBT rights movement, a New York State historic site. The extraordinary Greenwich Village bar and tavern, and the riots that occurred there in the late 1960s, sparked a national movement that later led to marriage equality in New York, first-in-the-nation executive action to protect transgender individuals, and regulations to ban conversion therapy. 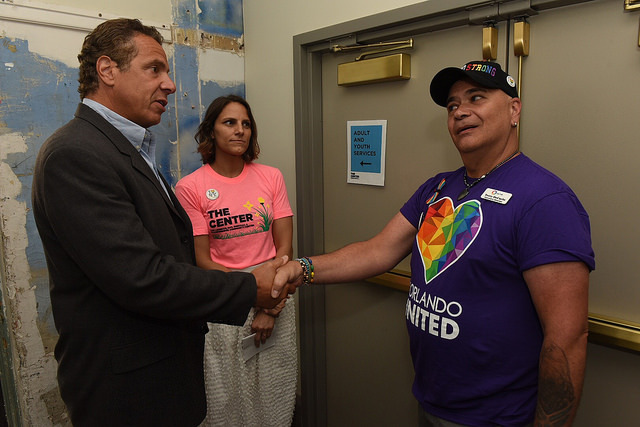 The Governor made the announcements at the LGBT Community Center ahead of the 46th annual Pride Parade in New York City. The Governor also unveiled the “Open Doors Campaign,” a new promotional effort highlighting New York’s longstanding role as a national leader in the fight for LGBT rights, freedom and social justice. The campaign, which includes three digital and broadcast advertisements, will begin airing this Sunday and run in New York, North Carolina, Mississippi and Texas throughout the summer. Following the tragic shooting that occurred in Orlando, Florida on June 12, the Governor issued Executive Order No. 158, establishing the LGBT Memorial Commission. As New Yorkers and Americans continue to mourn this loss, the Commission will work to design and build a new memorial in honor of the LGBT community and the victims of the Orlando shooting. The state has identified two potential locations for the memorial, including Battery Park City, overlooking the Statue of Liberty, or Chelsea Piers on the western edge of the Greenwich Village. The Memorial Commission will begin its work immediately and provide recommendations to the Governor pertaining to the site, design and installation of the memorial no later than December 31, 2016. The commission will be comprised of ten members appointed by the Governor, and be overseen and coordinated by Counsel to the Governor Alphonso David. The “Open Doors Campaign” features top executives of New York State-headquartered Fortune 500 companies who reflect how New York’s business community is strengthened through its diversity. Featured leaders include: Ajaypal Singh Banga, President and CEO, MasterCard; Martin Chavez, CIO, Goldman Sachs and; Indra Nooyi, Chairman and CEO, Pepsico. The campaign, which includes three digital and broadcast advertisements, will begin airing this Sunday and run in New York, North Carolina, Mississippi and Texas throughout the summer.